real people, or real locales are used fictitiously. Other names, characters, places, and incidents are products of the author’s imagination, and any resemblance to actual events or locales or persons, living or dead, is entirely coincidental. The text for this book is set in Adobe Garamond and Lomba. The illustrations for this book were rendered with Staedtler Pigment Liner pens on vellum paper and were colored digitally. 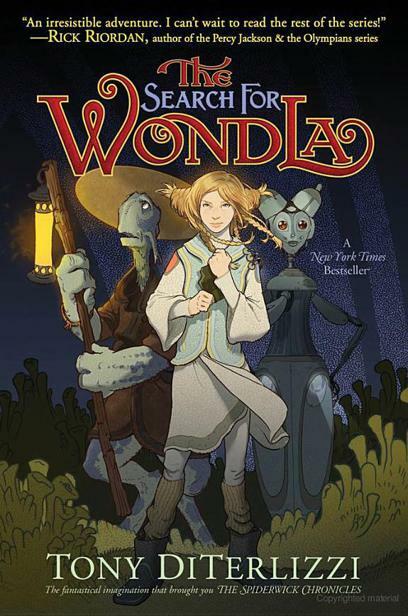 The search for WondLa / Tony DiTerlizzi. — 1st ed. Summary: Living in isolation with a robot on what appears to be an alien world populated with bizarre life forms, a twelve-year-old human girl called Eva Nine sets out on a journey to find others like her. Features “augmented reality” pages, in which readers with a webcam can access additional information about Eva Nine’s world. [1. Science fiction. 2. Human-alien encounters—Fiction. 3. Identity—Fiction.] I. Title. READ THEM MORE FAIRY TALES. was dying. The tiny scarlet dots on her hand mirrored the glowering eyes of the snake that had just bitten her. Sitting down on the prickly ground of dead brown pine needles and small cones, she felt the curdled coil of nausea wind its way up her throat from her stomach. She dropped the sweaty handful of moss that she had scooped up from the forest floor. “Kindling,” her Omnipod had instructed her earlier in its chirpy voice. “Find a flammable substance such as dry twigs or moss to begin your fire.” The large gathering of boulders Eva had found had seemed like the perfect place to make a shelter for the night, and the surrounding area was blanketed in ashen puff-patches of reindeer moss. As she had knelt down to gather a clump, Eva had realized there was a rust-colored, mottled snake just next to her, sunning itself in the fading light. She’d realized too late, though, to avoid its bite. Now, with trembling hands, she fumbled through her dingy satchel to retrieve her Omnipod. The handheld metallic device was flat, like a magnifying glass, with a small circular hole in the middle of it that resembled an eye. Eva’s heart pounded, as if trying to escape her chest. She swallowed, interrupting the hectic meter of her breathing. The shoulder patch on her tunic blinked off and on in warning. Eva closed her eyes and concentrated. She put the device to her forehead, as if the Omnipod would whisper to her brain the command she needed. “Greetings, Eva Nine. How can I be of service?” the device chirped. “Do you mean Individual Medical Assistance? IMA for short?” the Omnipod corrected her. “Yes,” she answered, licking her dry lips and trying to hold her insides in. “Yes! I need help right away!” Eva yelled at the Omnipod. “S-snake bite,” Eva said with a gulp. The nausea lurked just under her tongue, ready to leap out. Through glassy eyes Eva scanned her immediate area; she could no longer focus on the terrain around her, let alone find a snake disguised as the forest floor. Her eyes rolled up into her head. Her breathing slowed. She let the Omnipod slip from her fingers. A voice from the heavens echoed through the landscape. It was a kind and graceful voice, like the sort she’d heard coming from a beautiful woman in an old movie. “Eva. Eva, dear, please get up,” the voice said. Just like in an old moving picture, Eva could also hear the slightest bit of static hidden in the dulcet intonation. The pine trees seemed to whisper the girl’s name as the cool of evening blew in. Somewhere in the distance a whip-poor-will beckoned the night. Eva cracked open her pale green eyes into little slits. The girl rolled onto her side. Lying on the forest floor, she examined the tuft of moss in her hand. She saw that the delicate network of stalks really did make it look like a shrunken tree, albeit a washed-out lifeless one. How does such an insignificant plant survive in a big world? What is its purpose? What is my purpose? She turned her attention back to the little moss tree and pouted. “It’s not like you have to worry about that,” she muttered. The clump of moss in her hands vanished, dissipating into a cloud of light motes. Eva curled up into a ball, shutting her eyes as the world around her also evaporated into nothingness. Emptiness. “Leave me alone,” the ball replied. Still curled in a ball, Eva said nothing. “Of course, I have to mark you as a failure on this particular survival skill test. We shall try it again tomorrow. All right?” said the voice. A warm hand brushed Eva’s half-braided dirty-blond hair. At last Eva stood up. Two dark orbs, emitting an amber glow from deep within, reflected Eva’s own face in a distorted fashion, like a fish in a fishbowl. Large automated eyelids clicked open and closed in a lifelike manner. Several other eyes, small and unblinking, studied the girl, recording endless data and sending it to a computerized brain. A brain that was contained in two metallic canisters mounted on the back of a head—the front of which displayed a mechanized silicone-rubber face. One of the robot’s telescoping arms extended from a carousel of several additional arms folded up around the cylindrical torso. Four wiry fingers, also tipped in silicone rubber, rubbed Eva’s shoulders in a reassuring fashion. She crossed the wide squarish white room and headed for the low doorway. Buff-colored rubbery floor tiles absorbed the sound of her plodding footsteps. Though the chamber was only dimly lit, there was still enough light coming from the holo-projectors mounted around the ceiling to show that the room itself was empty of anything … except for the human girl and the pale blue robot. Eva sulked as she shuffled into the main hub of her living quarters. When the large doors to the holography chamber slid shut behind her, a pastoral scene was projected onto them in vivid detail. Cottony clouds drifted aimlessly across a brilliant azure sky over distant lavender mountains. This gave the effect that the entire hub was like a grand outdoor gazebo, displaying a magnificent vista in the round—though one projection was not working properly and flickered into a corresponding nighttime scene, ruining the illusion. “Welcome back, Eva Nine.” The intercom spoke in a relaxed tone. Its words reverberated throughout the octagonal chamber. “How may I help you?” Water trickled in a distant stream, and songbirds sang, filling the vestibule with ambient sounds coinciding with the scenery. “Hi. Please open bedroom doors, Sanctuary,” Eva said, stomping across the hub toward the far window. Projected on it was a spectacular view of a misty waterfall cascading down from a colossal mountaintop. The cast image crackled when the girl passed through it, as through a holographic curtain, into the open doors of her dimly lit bedroom. “Close doors, please.” Eva flung her jackvest onto her medi-seat. She sat down on the edge of her foam bed and kicked off her sneakboots. As she flopped back onto the oval mattress, Eva stared up at the myriad of pipes and exhaust shafts that wound through her white ceiling. There were water stains on the corner ceiling tiles of the small room, like large ochre flowers blooming from the pipes. One of the overhead lights flickered in an annoying, erratic tempo. With her hands behind her head, Eva rubbed the raised round mole on the nape of her neck. The warmth of her electric bed permeated through her tunic in a comfy sort of way. Her eyelids drooped, and she had begun to doze off when her bedroom doors slid back open. “Please, Muthr, I just want to be alone for a while,” Eva barked at the ceiling. Muthr hung the jackvest on the empty row of coat hooks lining the wall. “Dinner is at eighteen hundred hours. Please be timely, Eva,” Muthr said. After Muthr rolled out of the room, the doors slid shut behind her. Eva reached under her head and grabbed her pillow. As she squeezed it over her face, she screamed. spinach and strawberry salad,” sang Muthr as Eva walked into the kitchen and flopped down at the booth. The eggshell-and-cream colors of the kitchen walls and numerous stacked cabinets did little to make the compact room appear cozy. A scratched, scuffed oven dominated the far wall, with a large exhaust vent growing out and up through the ceiling. Mounted next to it was a sink that had a variety of faucets and taps dangling over it like metallic-ringed tentacles. Eva picked at a dried bit of food on the steel tabletop. Eva picked up a strawberry the size of her fist and grabbed a knife from the knife block. Eva placed the immense strawberry on its side, ready to slice. “Are you not forgetting something? Are your hands washed?” Muthr asked, still facing the sink, where she was now washing spinach leaves. Eva rolled her eyes and joined her. “If we start tomorrow, several more weeks—or twenty-four more days, to be exact,” Muthr answered, scraping the chopped spinach into a steel salad bowl. “Twenty-four days?” Eva said, shocked. “Why don’t we just go out and do some of these exercises for real? I’m sure I’d do a lot better.” She lopped the green star-shaped top off a strawberry and sliced the fruit. “You know good and well that you are not yet ready,” Muthr replied, opening a large cabinet door. The cabinet was stocked full of marked containers of different sizes meticulously arranged as in a giant spice rack. “You know … others. Humans, like me,” Eva said, keeping her gaze focused on cutting the ripe red fruit. Eva mouthed the last line in perfect unison while she lopped the top off another strawberry. “But I think that’s why we need to leave. To explore and find out for sure,” she countered. “I do understand. Now please pay attention. Focus on what you’re doing.” Muthr’s tone was stern. The kitchen was silent except for the clicking of Muthr’s blinking eyes. She studied Eva with her deep dark orbs. The pot on the stove began to burble softly. Somewhere high above, an exhaust fan hummed as it sucked the heat up and out of the room. Eva sneered at the robot, waiting for a reaction. She wondered what Muthr was thinking with all of those zeroes and ones coursing through her electrical nervous system. It was then that Eva realized that she was bleeding. “Eva!” gasped Muthr, wheeling toward her. “I just nicked myself with the blade. That’s all,” Eva said, putting her thumb into her mouth. As she lapped the tiny wound with her tongue, she could taste her blood. She could feel the pulse of her own heart. Eva pulled out her thumb and allowed Muthr to study it. At the same time, dinner preparations resumed, as Muthr dropped several pills from the cabinet into the simmering pot of water. The small kitchen began to fill with the scent of roasted chicken. She walked out to the hub, manually activating an adjacent door, which led to the supply room. As the door slid shut behind her, Eva walked past the labyrinth of shelves containing all manner of household items: electro-gaskets, holo-bulbs, lumen-packs, various cleaning products, and hydration kits. “Hello, Eva Nine. May I help you find something?” asked the calm tone of the Sanctuary over the intercom. “Medical sticky bandages with SpeedHeal ointment are located on the bottommost shelf,” the Sanctuary said. “Thanks,” Eva said, pulling open a metallic bin. She grabbed two, pocketing one of the medi-stickers in her tunic. She ripped open the plastic packet with her teeth and placed the medicated sticker over the congealed blood spot on her thumb. Pausing in the shadowy aisle of shelves, Eva listened. Through the ply-steel walls she could hear Muthr humming as the robot set the table. Eva walked to the very back of the storage room and stared at the faint outline of a sealed doorway. A doorway she wasn’t supposed to know about.
. Muthr entered her faintly lit room and moved through the clutter on the floor. “I thought I asked you to pick this up,” she said as she approached Eva. “Pause program, please,” commanded Muthr in that cheery tone of hers. “I made some notes of my own and thought you might want this,” she said, handing Eva an electra-paper. “Well, we need to go over it again until you get it right,” Muthr replied. Eva slid out of bed and threw a blanket over the life monitor peering down from above. She pulled on her sneakboots, then grabbed her satchel from the nightstand. As she did so, her Omnipod was knocked onto the floor. Jostled, it projected a life-size hologram of a girl in workout attire. Her face bore an uncanny resemblance to Eva’s. “No, no, no!” gasped Eva, reaching down for the device. “Deactivating,” the device whispered back. The hologram evaporated, leaving a whitish glow illuminating Eva’s face. “Is there anything else I can assist you with, Eva Nine?” it asked. Eva opened her bedroom door and stepped out into the main hub. From under the soles of her sneakboots, she could hear the squish of disinfectant seeping up from the floor tiles as the Sanctuary began its nightly cleaning. The stinging scent of cleaner hung in the air, causing Eva’s eyes to water and the inside of her nose to burn. She snuck along the perimeter of the hub on a path farthest from Muthr’s quarters, the control room, in hopes that the ever-vigilant robot would not hear her. Thankfully, the door to the supply room was malfunctioning and could no longer be voice activated. Eva tapped a glowing green button, and the doors slid open with a low hiss. Eva froze, waiting for the doors of Muthr’s quarters to slide open in response. What would she tell her if she were caught? Medi-sticker, she thought. The old one fell off in the shower tonight. Eva slipped into the supply room, her body heat activating the overhead lights. Watching the door slide shut, she brought the Omnipod close to her mouth. “Omnipod, please instruct the Sanctuary to open the back hatch in the supply room,” she whispered into the device. The Omnipod entered lumen mode, and the device created a strong beam of light from its central eye. As Eva made her way down the long, winding corridor, she thought back to her first discovery of the secret hallway… . She’d been five years old, playing hide-and-seek with Muthr. Eva’s favorite place to hide had been the empty cabinet under the kitchen sink, but she had grown some and could no longer fit under there. Instead, Eva had found her way into the very back of the labyrinthine supply room and had hidden behind the last shelf full of nutriment capsules. Giggling, she had leaned against the back wall, sliding into the shadows and awaiting the sound of Muthr’s playful voice. On the cold surface of that wall, Eva had felt the unmistakable seam of a doorway. Muthr had found her moments later trying to get the Sanctuary to open it. The robot had told her it was a malfunctioning door that had been sealed off long before Eva Nine had been born. Eva had soon forgotten about the mysterious door, until the day she’d made the other discovery. Eva had puzzled over this cryptic code for days. She’d wondered if she should go and ask Muthr about its meaning. She’d pondered this idea, but had hesitated, for it was also at that time that Eva had started to realize that she and Muthr were truly not the same. This observation had led to a notion that had itched at the back of her mind: She wasn’t being told everything. Eva had returned to her dresser and stared at the words written inside the drawer. That was when she’d asked her Omnipod what a “floor plan” was. The device had prattled out a lengthy definition, projecting lavish holograms of various architectural layouts, then had asked if she wanted to know more. She had not. Finally, Eva had asked what “CP01” was. Here, the Omnipod had had no answer. It had replied that the letters and numbers could be some sort of code, perhaps even for another computer or device. Still puzzled, Eva had looked at that cryptic message day after day, trying to determine its true meaning. In time, she’d forgotten about it. A year later, she’d been removing her old clothing, which no longer fit, from her dresser drawers. Once again, she’d spied the secret words. “Show me the Sanctuary’s floor plan,” she had instructed the Omnipod when she was nine years old. Once again, a dazzling hologram had floated up, expounding in great detail about the different chambers of the girl’s home. Immediately, Eva had realized that there were holes in this hypnotic display—pieces of the Sanctuary that were missing. The Omnipod hadn’t been showing her everything. The Omnipod had asked for a username and a password. She now approached the halfway point of the long hallway. The humidity had increased as she’d trekked farther down the winding corridor. Moisture clung to the walls, and small fungi dotted the ceiling in places. “Almost there,” whispered Eva, her voice echoing through the darkness. When Eva had first wandered into this new, uncharted area, she’d been thrilled and terrified all at once. Now she moved without hesitation. Her destination was just ahead… . “Because trees cannot grow here,” Muthr had replied, dropping a pill into a cup of water. It had fizzed as it had plunged to bottom of the cup, disintegrating. “But we have plants in our greenhouse. And my programs show trees. Big, enormous oak trees, growing in large forests,” Eva had said as she’d slurped up her drink. Muthr had told her the taste was like freshly picked oranges. “All in due time,” Muthr had replied, setting a bowl of oatmeal-flavored mush in front of her. All in due time… . Eva finally arrived at the end of the hall. Another door, identical to the one she had opened in the supply room, stood shut in front of her, its manual control panel darkened from water damage. She knelt down, adjusting the light on the Omnipod from a solid beam to a soft, luminous glow. The area surrounding the door was lined with a collection of odd and unusual objects that had been placed carefully in little organized rows leading to the door. The items ranged from clothing—shoes and crisply folded tunics—to toys and games, such as an animated rattle and a giggling ball. All had one thing in common: They were items that belonged to Eva that she was not yet ready to discard. She sat down facing a group of dingy stuffed animals at the head of this arrangement and opened her satchel. The toys did not reply. The silent collection stared back at her. Eva winced. “I know, I know. I think Muthr wanted me to fail and put it there on purpose—so I just dropped dead. I thought she was going to blow a gasket!” Eva chuckled. The hollow laugh echoed on the damp walls surrounding her. A muffled banging sound reverberated down the hall from the direction of the Sanctuary. She stopped talking and listened … but now all was silent. Eva’s eyes rested on a small, thin item hiding in the organized hoard. She plucked it up carefully and examined it closer. It was a blackened, crumbling, flat piece of material—different from anything else she’d ever held before. When she’d first discovered this item more than a year before, Eva had tried to identify it with her Omnipod, but the device had concluded that, “There is insufficient data. Not enough information to make an identification.” Eva had determined that it was likely a small piece of tile or even paneling, possibly a sign of sorts, as it was square shaped. On it was an image (a broken one, since it no longer moved) of a little girl holding hands with a robot and an adult. A Sanctuary that had been connected to another Sanctuary. Eva had seen the omniscient floor plan. However, like the door before her that led to the adjoining Sanctuary, they were now all closed off to her. Lifting the Omnipod up from the floor, Eva scanned the collection of unmoving toys. The soft light illuminated their blank faces. She paused on one, a grungy Beeboo doll. As she stood to leave, a tremendous shock wave rattled the entire Sanctuary, raining dust and debris from the corridor ceiling down onto Eva Nine. light danced wildly about the secret passageway as Eva rushed back toward the Sanctuary. She activated the door controls as another loud reverberation rocked the walls, causing her to stumble through the open doorway and back into the supply room. The shelves inside vibrated with each rumble, and several containers of disinfectant fell to the floor. Holding on to the shelves, Eva snaked her way to the front of the room just as the door hissed open. Standing in the entrance was Muthr. “Yes,” replied Eva, holding up her right hand, the device hanging from her wrist. “May I have it, please?” Muthr asked. Eva handed the Omnipod to her. Immediately its tiny lights began flickering in rhythm to a tiny light on Muthr’s torso. “What is that?” Eva shouted over another tremendous bang. The sound was coming from above them. All the lights in the Sanctuary flickered. “Is this another exercise? Or a drill? Because—” A shrieking siren cut her off, a noise Eva Nine had never heard before. With large eyes—frightened eyes—she watched the robot. Muthr was silent and stoic, but lights blinked in rapid succession all over her head. “Muthr, what’s happening? What is the Sanctuary telling you?” Eva asked. She huddled close to the robot as another shock wave boomed overhead. Muthr blinked out of her trance and addressed Eva. “An intruder has breached the Sanctuary’s doors and is now descending to the main entrance. Come now. We have only minutes to get you to safety.” With that, the robot spun around and wheeled out into the main hub. Eva hopped along behind her, slipping her jackvest on over her beige tunic. The Sanctuary shook again. “Kitchen doors, open, please,” Muthr commanded, and she barreled through the adjacent door. “Not now, Eva, dear.” Muthr grabbed Eva by the wrist and yanked her inside. The robot slid open a small hidden panel near the doorway and began typing a sequence of numbers into a security keypad. The kitchen doors slid shut and locked. Over the sound of the alarm, Eva could hear the other doors in the Sanctuary lock as well. Next, the ambient sounds of the central living hub, along with every appliance within the Sanctuary, powered on with the volume at maximum level. There was an escape hatch right here in the kitchen all this time? The floor plan on the Omnipod had shown only one way out, and that was through the robot’s quarters. A loud sonic vibration, just outside in the central hub, rattled the walls of the Sanctuary. A mighty explosion erupted, as if a door were being blown to pieces. Kneeling down in the exhaust shaft, Eva looked at Muthr. Her heart was pounding in tempo with her rapid breathing. Room 5. That’s my room. My life is in there. My clothes … my bed … my entire holo-show collection. Room 5 was where Eva had dreamed up countless plans of how she was going to find others, just like her, and bring them back safely to her home. Friends and family would live with her and Muthr in the Sanctuary, just like the picture depicted on the WondLa. Another explosion rocked the kitchen. Eva nodded as it dawned on her what was happening. Her eyes started to sting. This scenario wasn’t on any list. Sure, she had wanted to explore the surface, but not this way. “Room six fire sensor has detected smoke,” reported the Sanctuary. It might as well have been greeting Eva, its tone of voice was so calm. “Please seal off the room and begin extinguishing sequence.” Static fuzzed over part of the announcement. Despite the growing heat from the fire outside, Eva’s entire body trembled as if she were chilled. A metal covering slid down, sealing the exhaust vent shut. Eva could hear a tremendous explosion and the kitchen door blow open. Frightened, she sat frozen at the bottom of the vent for the longest minute of her life. She listened to the rummaging and pilfering going on beyond the grate covering in what had once been her kitchen—what had once been her home. Eva thought of Muthr. She thought of her old friends hiding in the secret corridor. She started climbing her way up toward a distant flickering light at the top of the shaft. It seemed like miles away, and the light above turned into a tiny star shape every time tears streamed out of her eyes. Panting, Eva was approaching the nonmoving exhaust fan. As she neared the large unit, she could hear it chirp in a steady electronic beat. From below, Eva studied the fan’s wide greasy blades, encrusted with gray clumps of filth, as the chirping sped up in tempo.
. She grabbed hold of the fan’s central motor and pulled herself up past the flattened blades. The chirping sped up yet again. Sitting atop the large cylindrical motor, Eva caught her breath. The chirping became a rapid beep. Eva stood on top of the unit and could see a wheel-shaped handle above her lit by a single utility light. Grasping the wheel, she tried to turn it. “Turn, turn, turn,” pleaded Eva. The chirping stopped and the fan’s motor started up again. The vibration jolted Eva so much that she almost lost her footing. The toe of her sneakboot thrummed as the blades whacked at it. Another sonic shock wave echoed its way up the shaft, and Eva shrieked. The wave was followed by a rending sound at the bottom of the shaft, and metal clanging. The grill covering had been removed, and smoke now began to wind its way up the exhaust vent. Sensing the additional heat, the fan spun even faster. The entire unit vibrated, groaning under the additional weight of Eva on top of it. Through the fumes burning her vision, Eva risked looking down. Below, she could make out the glow of fire coming in from the kitchen grill, growing like an angry orange-red snake up toward her. Vertigo tried to topple Eva. She refocused on the wheel, pulling on it with every bit of strength that she possessed until it finally let out a low squeak and moved ever so slightly. The smoke was now so dense that Eva could no longer see her own hands in front of her. She coughed as noxious vapors filled her lungs. Mucus ran from her nose into her gritted teeth. “Come on!” she yelled as she blindly pried the wheel loose from its frozen position. At last the wheel spun freely just as the old, rusted bolts holding the fan unit below her gave out, one at a time. With each turn the top vent of the shaft opened a little more, sucking up the fire and its smoky breath. The fan came loose from the shaft walls, plummeting down to the flames below. Hanging from the wheel, Eva pulled herself up and grasped the edge of the vent opening. She squeezed her lithe body through the vent, and then tumbled down to the ground below. A ground Eva Nine had never set a foot upon in all twelve years of her life.